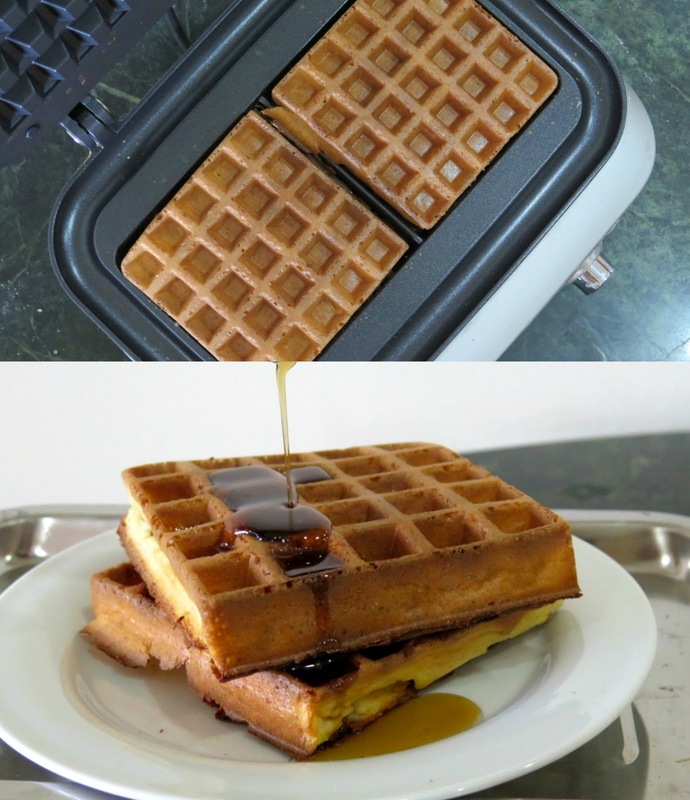 If you love waffle, particularly the good ones, then you should expect the right waffle maker to do the job for you. I have been searching for the best waffle in Singapore, tasted some of the best waffle and also some of the worst in a typical cafe. The biggest concern that makes a good or bad waffle, is not just the batter but it is how perfect the waffle maker can be. Waffle makers come in all shapes and sizes with a wide price range. Keep in mind that a low-cost product may not mean low quality, while a high-cost product may just be pricey because of the name brand. Here you will find product shots and actual tests that will help you make an informed decision about buying the best fit waffle maker. I had the opportunity to review The Smart Waffle from Breville, Australia’s leading premium kitchen appliances producer that provide creative, simple and inventive solutions to make our food preparation and cooking much easier and enjoyable. The iconic Aussie brand has recently arrived into our shores and retailing a selection of their innovative products at Takashimaya, Metro Centrepoint, Tangs Orchard and Robinson The Heeren. 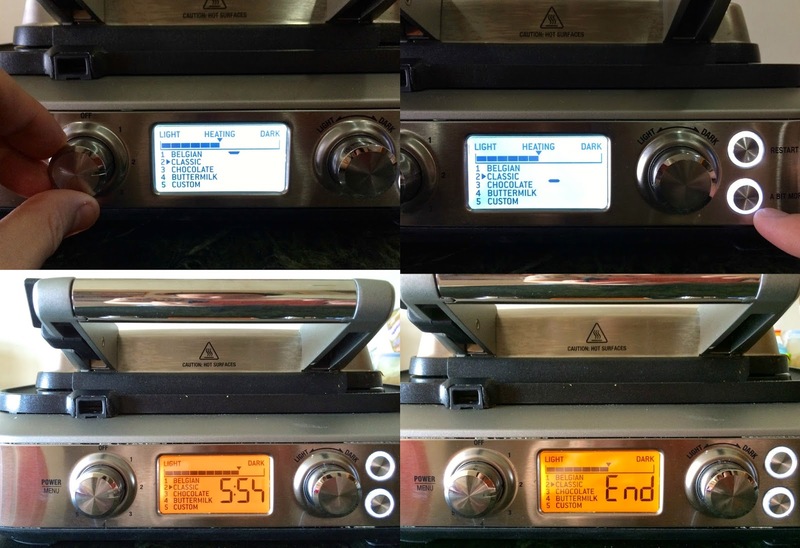 The Smart Waffle (BWM620) that I reviewed was a 2-slice maker retailing at S$398. The product is sleek with stainless steel housing and cast aluminium cooking plates coated with non-stick coating that makes crispy golden waffle without the mess. The LED screen shows cooking waffle option from Belgian, Classic, Chocolate or Buttermilk, as well as a custom setting which allows you to set your own waffle style. Knobs allows you to adjust the lightness and darkness of the waffle batch and a “A bit little more” button lets you add cooking time for crispier waffle. The LED screen changes colour to indicate time and when the waffle is done. With Breville Waffle IQ, the cooking time is automatically calculated to suit your waffle style and colour. The wide wrap around moat catches and cooks overflow for easy clean-up with a dishcloth or swept up with a pastry brush. 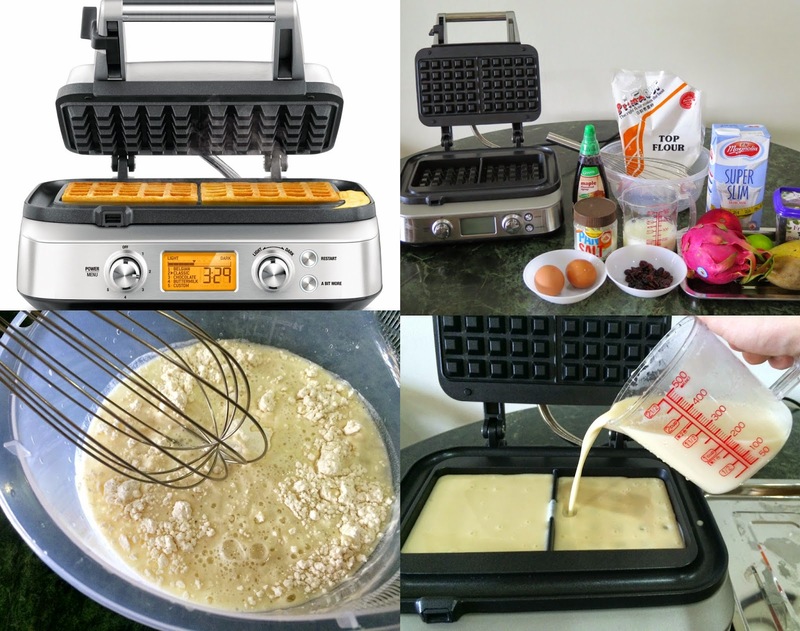 There is a collection of waffle recipes on the internet and a really good waffle recipe for light delicious waffle may varies with different name brand of waffle maker. I found and used the waffle recipe from http://allrecipes.com/recipe/waffles-i/ since it is one of the highly reviewed recipe. The first batch of waffles turned out just right, crispy and light but maybe a little thick as I poured in too much batter. I made some changes thereafter and saw huge improvements in the subsequent waffle batches. 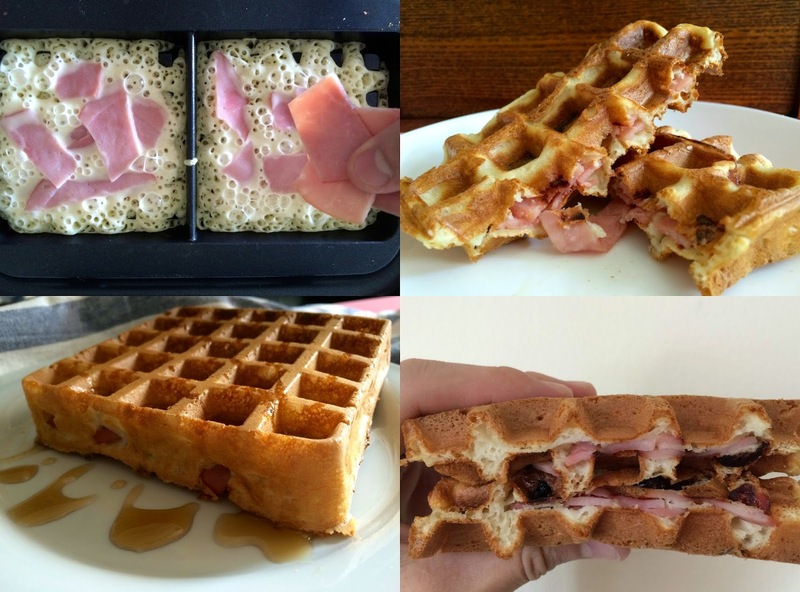 I made a few twists to the original recipe by adding ham and cheese, the new waffle batch still yield that light, airy texture and it stayed crisp long enough until served. Please do not ask me for personalised waffle recipe as there are too many easy-to-follow homemade recipes on the internet, which I followed as well. To simplify things, I’ll note down the original recipe here for your convenience. Preheat waffle iron by turning on the Smart Waffle and choose your waffle style. An audible beep from the Smart Waffle which tells you that the waffle iron is warmed. Cook until golden brown or when LED screen indicate End. Now the BIG question. 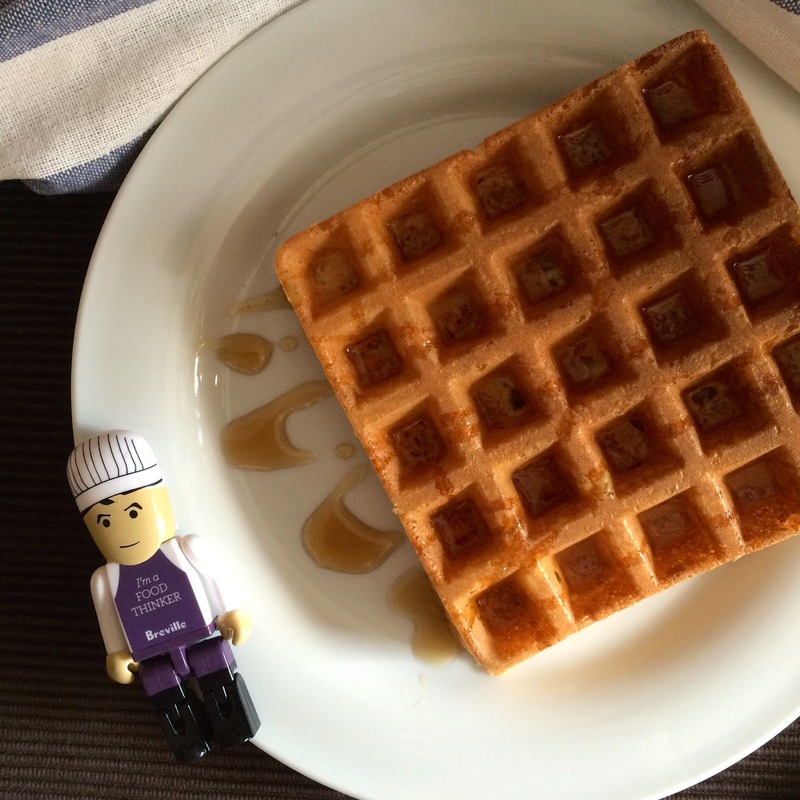 So how good is the Breville Smart Waffle? I actually found the Smart Waffle incredibly easy to use and the clean-up is one of the most important factors when considering a waffle maker. The non-stick coating makes clean-up easy with a dishcloth and pastry brush (not included). The Smart Waffle is truly beautiful and intelligent, it’s like a Ferrari of all possible waffle makers. If you have the budget for a smart and fancy machine, Breville can definitely help bring your household together.